What a great recipe to share. I am all over this one with awesome ideas all ready. I love philly cheese steak and my bunch does as well. I am thinking busy weeknight meal, football party night and so many other ideas. 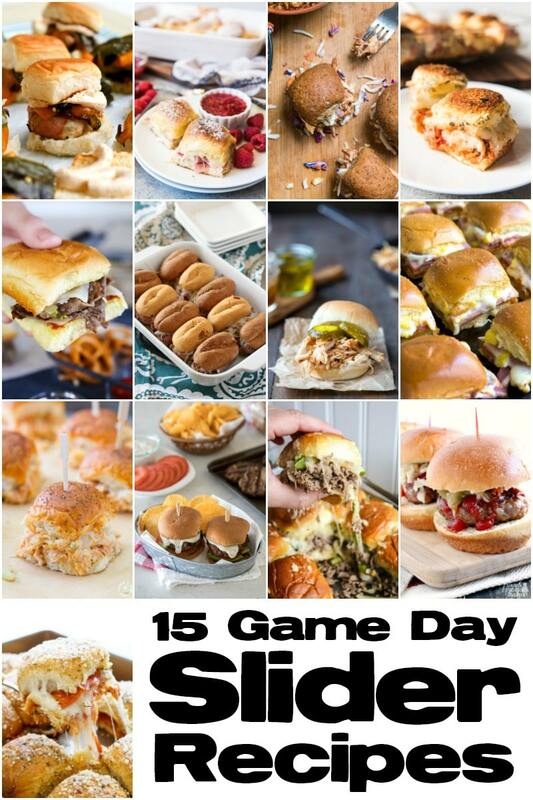 I’ve always avoided making sliders…too much work for each little sandwich. Seeing how you layered ingredients is the way to do this! Now I’m excited to give this a try. Thanks for your photos…very helpful. Looks so yummy and perfect for a crowd! Thanks! So much easier to lay it all out. found on pinterest, and now I have to have them! How does the bottom of these rolls not get soggy? Hi Barbara, since the veggies and meat have been cooked ahead of time there really isn’t much liquid. I’ve never had a problem with these getting soggy. Kat, My local grocery doesn’t carry pre-cooked meat. What cut of steak would make the most tender cuts for this sandwich? You can use thinly sliced sirloin. To make it easier to slice it thinly freeze the steak for about and hour then use a sharp knife to cut it into thin pieces. How much sirloin would you use? I actually use beef shaved steak by “old neighborhood”. They sell it at Big Y near me but I’m sure you can find it in other stores if you don’t have one near you. It is just like the steak they use for steak & cheese at a vendor at the fair! I also watched them sprinkle garlic salt on it while it’s cooking so I’ve been doing that now too & it tastes awesome! As for the mayo thing, I don’t really like mine heated so I just wait until my sliders are out of the oven, then put mayo on as desired. It’s just a preference thing. The beef shaved steak sounds awesome. I’m going to look for that next time I’m at the store. Thanks for letting us know! Just made this yesterday. So yummy. Everybody loved it. My husband said I need to do this more often. Thanks for sharing. I found this recipe and immediately wanted to try it but when I did make it the top buns were hard. Any suggestions on what I can do so that it doesn’t turn out hard? Hi Heather, you can leave it covered with foil for the entire time if your bread is cooking too quickly. I’m a little concerned about the mayo in the oven… Call me a newb if you’d like but the mayo doesn’t spoil? No the mayo doesn’t spoil. Mayo is used in lots of baked dip recipes. You may think of it spoiling if it is left out in the heat but that is just because bacteria can grow in it (and even that is debatable it is usually the other ingredients in a mayo based salad that actually spoil). You are totally safe in the oven! Mayo is made of egg whites and vinegar, it won’t spoil when used in cooking. Like all dairy, keep refrigerated the mayo jar once opened or leftover foods. I don’t like mayonnaise so I made a little garlic butter and spread it on my bottom halves of my buns and baked them for a few before adding everything else. Very yummy! That sounds amazing! I love garlic. 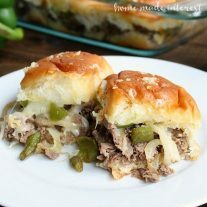 The philly cheesesteak sliders are good and easy but VERY high in calories!! I made this today in 90 degree weather YES I turned on my oven….and it was the bomb diggity …THIS RECIPE WILL BE A STAPLE IN MY HOUSEHOLD …MY FIANCÉ LOVED IT ???? Jannah, that’s awesome! We love getting comments like this. These were very good and quite easy to make. Family enjoyed them. The only complaint was they were a little to sweet. Next time I will try the hawiian butter rolls. Definitely will be making again and I used a one pound petite sirloin steak cut thinly and cooked. Thanks for recipe. Me and my family love this is do delicious you can’t go wrong! I’m so glad you like it. It’s a favorite around here too! What size package of steak? They come in packages. Use a 14 oz package. I’ll update that in the instructions. Yes! That is my favorite for this recipe. THEse look amazing. If I make these for a party and transport them and keep warm with sterno’s will they get soggy? I had no problem with the getting soggy just make sure to drain the grease and liquid from your meat and veggies. Hope you enjoy! These look so good .. must make 🙁 what are the nutrition facts? OK, so we used left over prime rib (sliced ultra thin) from Christmas dinner, used poblano peppers instead of bell peppers and used mozerella for the top cheese layer. The poblano peppers have a much better flavor than bland bells. Highly recommended! Have made this recipe a few times and it’s always a hit! Do you think I could assemble in advance and then refrigerate until it’s time to bake? I usually make the different components ahead of time then warm them up in the microwave before assembling and baking. I worry if you assembled ahead of time the bread might get soggy. 16 oz of meat is ideal. Made these for our annual Super Bowl Party. Added steak sauce to see what would happen. Vertict: Everyone loved them! Thanks for this easy tasty treat. I couldn’t find the rolls you mentioned and substituted another brand which worked out fine. Adding steak sauce sounds delicious! Smelled better than they tasted. Didn’t taste bad but they were very bland. Try adding garlic powder, that should be tasty! Is it possible to use ground beef with this recipe? Yes, just drain it as much as you can. I used italian beef it came out good. next time i will cut the rolls and toast them before added the ingrediants, i sprinkled italian seasoning on the mayo and oragano on top of the butter. Seasoning the Mayo sounds great. I will have to try that next time. Could this be made ahead of time and frozen? how did the Hawaiian buns not burn? I did the same temp and time and the bottoms were completely burned when I made sliders previously. I’m sorry Shar I’m not sure why the bottom buns would burn at that temp in that time. As long as the meat is warm you could try lowering the temp and just cooking until the cheese melts. I think something is missing in the directions/ingredients for the phily cheesecake sliders. It says to dice the onions, but it looks like very finely chopped onions are on top of the sliders, but sliced onion are sautéed with the green peppers. Is that right? 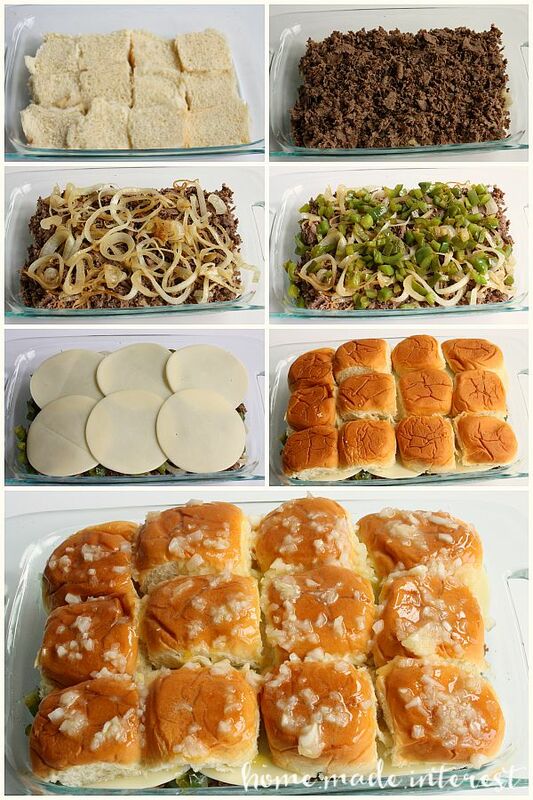 You are right you should save some of the onions and finely dice them for the top of the sliders. We did cut the onions mixed with the green peppers into slices for the sliders we made but we thought they were a little messy when we pulled the sliders apart so we changed the instructions to diced. Feel free to cut them either way. 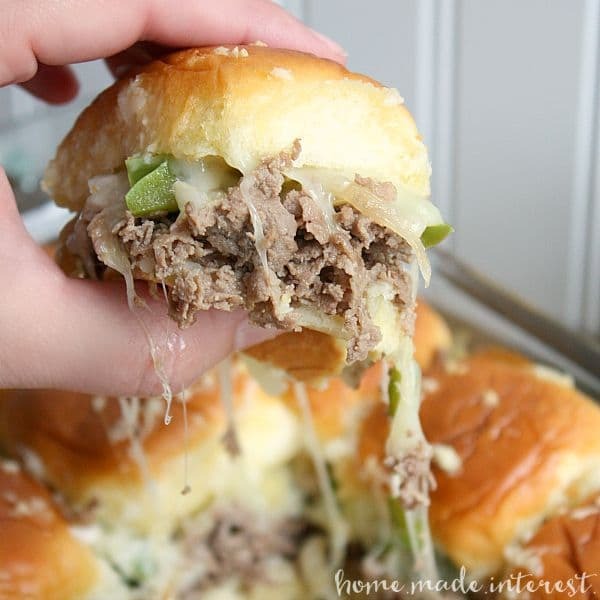 Could you use London broil deli meat instead of the frozen beef, I’m thinking on making these for my church’s mom group tomorrow and I’m wondering if that’s an option. I have never tried London broil deli meat before, but it sounds delicious! Try it and let us know how it turns out. These are amazing! For my friends and family, I use horseradish sauce instead of mayo. Also, put cheese on top and bottom both. These have become the football party favorite! Mouth watering and so great for a crowd! Thanks! They are a favorite in my house!